Thoughts on Going Sulfate & Silicone Free.. Recently I've been growing more & more interested in the hair products without silicones & sulfates hype. It's nothing very recent & a topic I come across on blogs and websites every so often, but only recently I decided I'd give it a go myself to see what all the fuss is about. 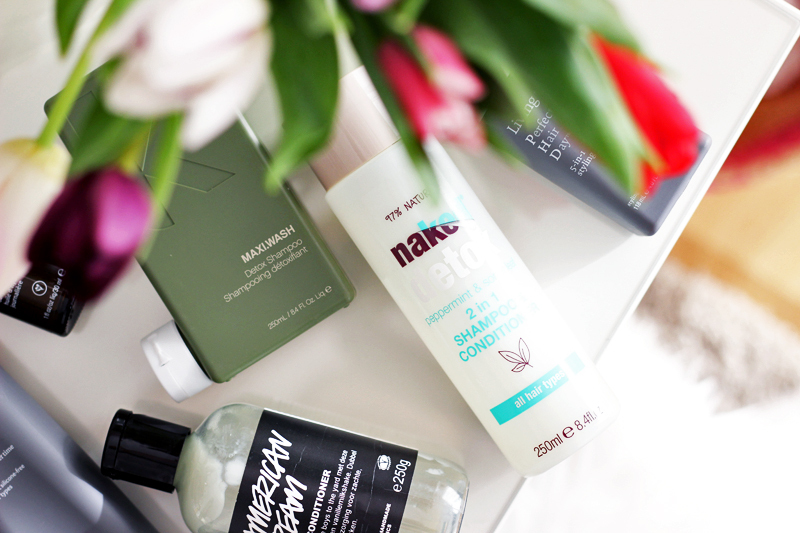 I've always used products containing both silicones and sulfates and never really thought twice about it: the two actually go hand in hand as it takes sulfates to remove most types of silicones, so I didn't think I was doing my hair any harm. When I dyed my hair again (after around four years of natural 'do!) a few months ago I noticed the toll of chemical dyeing immediately, so I went looking online for product recommendations suitable for chemically dyed hair that could maintain my shiny locks. I again stumbled upon the advice to quit using all hair products containing sulfates and silicones. So I did. The idea is that silicones build up in your hair and prevent your hair from retaining moisture. Silicones make your hair all shiny and glossy, but in reality your hair is coated in a small layer of silicone which makes it look that way. This isn't necessarily bad as long as it doesn't build up, so it takes certain kinds of shampoo to wash out certain kinds of silicones. Water soluble silicones can be washed out with gentle shampoos as they'll rinse away immediately. Non-water soluble silicones are trickier and need a heftier shampoo containing a sulfate to be removed. The heavier silicones also attract dirt & make it cling to your hair, which can make your hair dirty quicker than it should. There are several kinds of sulfates: the harshest kind can be quite drying for your hair as they'll strip away all the silicones, but also most of your hair's natural oils. Not only can this dry out the lengths of your hair, but it can also make your scalp produce more oil than really necessary. I was surprised to find that so many of you were also experimenting with alternative ways to care for your hair. I got so many responses on Twitter! Check out the thread here for some inspiration. Water soluble silicones: Dimethicone Copolyol, Lauryl Methicone Copolyol, Hydrolyzed wheat protein (Hydroxypropyl Polysiloxane) & all silicones that start their name with PEG. More specific info here. Special case non-water soluble silicones: Amodimethicone, Bis-Aminopropyl Dimethicone, Silicone Quaternium-16 (and -18 and -22), Trimethyl Silylamodimethicone. These are special cases as these are supposed to resist build-up because of their positive charge), More specific info here. Non-water soluble silicones: Trimethylsilylamodimetheicone, Dimethicone, Phenyl Trimethicone, Cetearyl Methicone, Dimethiconol, Amodimethicon, Stearyl Dimethicone, Cyclomethicone, Cetyl Dimethicone, Cyclopentasiloxane, Behenoxy Dimethicone & Stearoxy Dimethicone. More specific info here. Sulfates: Sodium Lauryl Sulphate, Sodium Laureth Sulphate, Ammonia Laureth Sulphate, TEA Laureth Sulfate, Sodium Myreth Sulphate, ..
Sulfate alternatives: Sodium Cocoamphoacetate, Cocamidopropyl Betaine, Lauryl Glucoside, Coco Glucoside, Disodium Laureth Sulfosuccinate, Disodium Lauroamphodiacetate, ..
Believers of the low poo method will quit using commercial shampoos and conditioners all together, but I couldn't commit myself to trying this route. 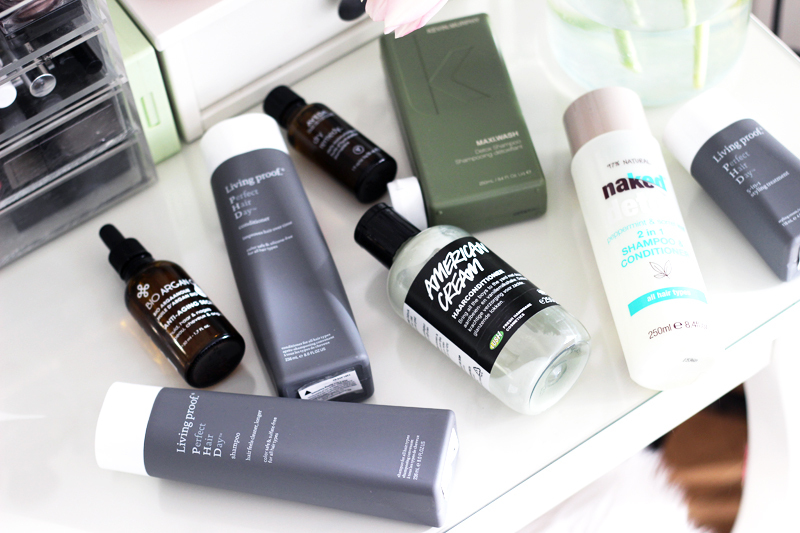 So I opted to ditch all of my products containing sulfates and silicones & replaced them with a few alternatives to check whether I'd notice any spectacular, mind-blowing & ah-mazing effects. While some people feel like silicones and sulfates are the devil, I feel like that's probably not always the case. It'll depend on how your hair type reacts to them - hair care is very personal. My journey might not be yours - so do go ahead and experiment yourself! For good measure: I have thin hair that has a bit of a frizzy wave to it. I can't let it air-dry as it looks horrible and I always need to use straighteners to get it to look somewhat decent (either curled, wavy or straight). I've started my quest with switching to a silicone free conditioner a few months ago - I really love LUSH's American Cream Conditioner. It smells really good and it's great for regular conditioning after shampooing. And most importantly: it contains a lot of natural goodness, and no silicones at all. I also started switching up my hair oils about two months ago. I noticed that a lot of my regular hair oils contained a few different silicones, so I went out and purchased a 100% natural & cold pressed Bio Argan Oil in my local nature shop. I also really love using Aveda's Dry Remedy Daily Moisturizing Oil which contains a blend of natural oils and no single silicone. I immediately noticed how much more potent these oils are - you really only need a few drops! For shampoo I started my journey by clarifying my hair with a detox shampoo. These shampoos are designed to get rid of all the build-up in your hair, basically giving you a blank (and super clean) slate to start with. These aren't shampoos to be used daily, mind you! This time I used Kevin Murphy's Maxi Wash Detox Shampoo, which detoxifies your hair by using fruit acids (AHA) instead of sulfates. A nice drugstore version I've liked using over the past years is the 2-in-1 Detox Shampoo & Conditioner by Naked. Even though it says it's 2-in-1, I still use a conditioner afterwards. For my regular shampoo routine I've started testing the Living Proof PHD (which stands for Perfect Hair Day) range out since a couple of weeks. This brand is co-owned by Jennifer Anniston and her personal hair stylist and boasts about the unique and innovative formulas that replace the use of silicones and sulfates. Living Proof's scientists replace these with newly invented & patented molecules like the OPFMA molecule that is used in the PHD range to replace silicone. While OPFMA in many ways offers the same results silicones promises, it's designed to repel dirt and oil which should keep your hair cleaner for longer. And Living Proof claims it's much healthier for your hair in the long run. 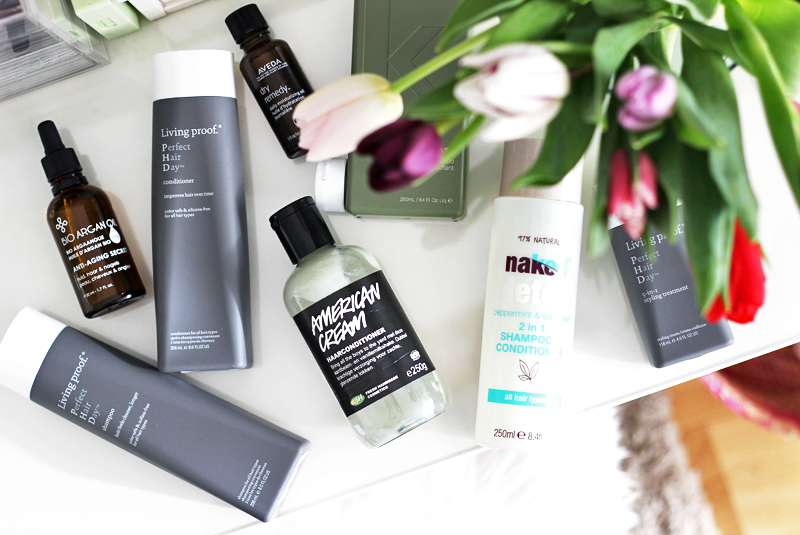 I am trying the PHD Shampoo & the PHD Conditioner, as well as the PHD 5-in-1 Styling Treatment. I will review this range separately in another post as I'm still figuring out what my opinion is on it. My hair has been quite dry since I ditched silicones altogether, but I heard that this is a phase your hair needs to go through before it gets better. Some days I'm totally in love with the Styling Treatment as it keeps my straight style perfect all day through, other days I notice waves peeping through after only a few hours.. I definitely need a little more play time with these. Let's see! Also a special thanks to the Living Proof HQ in Belgium for answering a few of my questions!